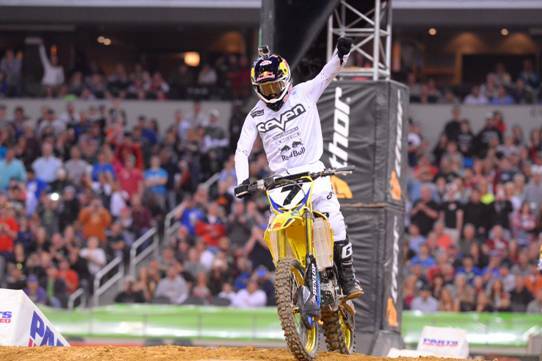 ARLINGTON, Texas (February 15, 2014) – In front of 54,421 fans inside AT&T Stadium, Team Yoshimura Suzuki’s James Stewart won his second straight Monster Energy AMA Supercross, an FIM World Championship, race with a dominant performance in the 450SX Class for the 47th win of his career. In the opening race of the Eastern Regional 250SX Class Championship, Monster Energy/Pro Circuit/Kawasaki’s Adam Cianciarulo captured his first career victory in his Monster Energy Supercross debut. Red Bull KTM’s Ryan Dungey raced to the Nuclear Cowboyz® Holeshot Award to start the 20-lap 450SX Class Main Event, edging out Stewart and Monster Energy Kawasaki’s Ryan Villopoto. By the conclusion of the opening lap, Team Honda Muscle Milk’s Justin Barcia had moved into third, with Toyota/Yamaha/N-Fab/JGRMX’s Justin Brayton in fourth and Red Bull KTM’s Ken Roczen in fifth. Villopoto crossed the line in sixth. Dungey led the opening three laps before Stewart made the winning pass and pulled away steadily for the remainder of the Main Event. Dungey was never challenged for second, but the battle for the final spot on the podium waged on between Barcia, Brayton, Roczen, and Villopoto. Both Barcia and Brayton took turns occupying the position while Villopoto challenged for the spot in the late stages of the race. Ultimately, Barcia held on to third to secure his first podium result of the season. Stewart moved to within one victory of tying five-time Monster Energy Supercross champion Ricky Carmichael for second on the all-time 450SX Class wins list. It was his first win inside AT&T Stadium, but his third in North Texas following wins in 2005 and 2007 inside the old Cowboys Stadium in Irving, Texas. He also joins Villopoto and Discount Tire Racing/TwoTwo Motorsports’ Chad Reed for the most wins in the division this season with two. Villopoto finished fourth to maintain his lead in the championship standings, which now sits at 12 points over Roczen, who finished sixth. Stewart moved into third place, 14 points out of the lead. Reed, who suffered an injury on the final lap of competition one week ago in San Diego, attempted to practice on Saturday despite a broken scapula, collarbone, and T1 vertebrae, but ultimately pulled out of competition. He fell from third to sixth in the championship. By virtue of his victory, Stewart assumed control of the Toyota Triple Challenge and holds a one-point lead over Villopoto and Barcia. With one race remaining in the Triple Challenge from East Rutherford, N.J., on April 26, Stewart is now in position to win a new Toyota Tundra if he maintains the advantage. The wins by Reed and Stewart in the first two races mean that no rider will claim the $250,000 bonus for winning all three Main Events. Cianciarulo began his first career Eastern Regional 250SX Class Main Event by racing to the Nuclear Cowboyz Holeshot Award, bringing his Monster Energy/Pro Circuit/Kawasaki teammates Martin Davalos and Blake Baggett with him. Davalos, who was the fastest rider in practice, made a pass for the lead on the opening lap but crashed on Lap 3, allowing Cianciarulo to reclaim the top spot and Baggett to take over second. Yamalube/Star Racing Yamaha’s Anthony Rodriguez took over third in his first career professional start, but crashed out of the race on Lap 6, handing the position to TiLUBE/Storm Lake Honda’s Gavin Faith. Out front, Cianciarulo and Baggett opened a significant advantage over the rest of the field before Baggett made a pass on Cianciarulo for the lead on Lap 7. The rookie rider responded quickly and retook the lead in the next turn. On Lap 8, Faith crashed out of the race, which allowed Davalos to move back into podium position. Once back out front, Cianciarulo extended his advantage to become the first rider since Trey Canard in 2008 to win in his first career Monster Energy Supercross start. Baggett finished second while Davalos rebounded from a pair of crashes to climb his way from sixth to third and secure a podium sweep for Monster Energy/Pro Circuit/Kawasaki. Monster Energy Supercross visits Atlanta’s Georgia Dome next Saturday, February 22, for the eighth race of the 2014 season. Live broadcast coverage on FOX Sports 2 begins at 7:30 p.m. ET.